Fans of Mumford & Sons who were hoping to see them headline Bonnaroo's main stage this weekend are out of luck. The band just announced it is canceling its June 15th appearance at the giant Tennessee festival, along with upcoming dates at Colorado's Telluride Bluegrass Festival and Kansas' Cricket Wireless Amphitheater, while bassist Ted Dwane recovers from an emergency surgery to remove a blood clot from his brain. It is with great joy that we can announce that Ted has been discharged from hospital and is on the road to a full recovery. The surgery went well, and the excellent medical team helping him are very pleased with his progress. He has been nothing short of heroic in how he has handled the whole ordeal, and now it has been medically proved that he does indeed have a brain. Today, however, also marks the end of our Summer Stampede Tour. We were hoping to have made it out by Bonnaroo this weekend. But it is with sadness that we have to announce the cancellation of our scheduled performances at both Bonnaroo and Telluride Festivals, and our show at Cricket Wireless Amphitheater in Bonner Springs, KS. If we could've we would've, you know that about us. We trust that you can respect our collective desire to encourage Ted to make a full recovery, and that this is based purely on the medical advice we have received. On behalf of Ted, and all of us really, we would like to thank every one for their compassion and support at this time and we are very excited to get back out on tour as soon as we can. 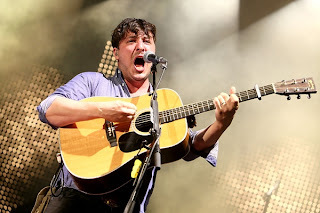 Mumford & Sons announced earlier this week that they were scrapping three pre-Bonnaroo shows, citing Dwane's health. The band has more summer dates planned, including major stops at the U.K.'s Glastonbury and Chicago's Lollapalooza. It remains unclear who will take Mumford’s Saturday night headlining slot at Bonnaroo.